The Netherlands, officially Kingdom of the Netherlands, is a country in Western Europe with three island territories in the Caribbean. Internationally, the name 'Holland' is often used to indicate the Netherlands. The European part of the Netherlands borders Germany, Belgium, and the North Sea. The largest and most important cities in the Netherlands are Amsterdam, The Hague and Rotterdam. 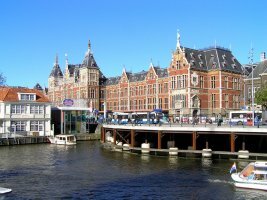 Amsterdam is the country's capital, while The Hague holds the Dutch seat of government and parliament. The port of Rotterdam is the largest port in Europe. The Netherlands has the 17th-largest economy in the world which is a market-based mixed economy. The Netherlands is the world's second largest exporter of food and agricultural products, after the United States. This comes thanks to the fertility of the soil and the mild climate. Almost 80% of exports are to European nations. The Netherlands is one of the world's 10 leading exporting countries. The largest industrial sector is based on foodstuffs. Other major industries include chemicals, metallurgy, machinery, electrical goods, and tourism. The Dutch agricultural sector has a strong focus on international exports. It accounts for 21 percent of the Dutch total export value. The Netherlands has, at some time in recent history, supplied one quarter of all of the world's exports of tomatoes, and trade of one-third of the world's exports of chilis, tomatoes and cucumbers goes through the country. The country's exports of apples accounts to be one-fifteenth of the world's exports. A significant part of Dutch agricultural exports consists of fresh-cut plants and trees. The Netherlands exports two-thirds of the world's flowers and flower bulbs. The Netherlands’ main export partners are Germany, Belgium, France, the UK, Italy. The Netherlands is a founding member of the EU, Eurozone, G-10, NATO, OECD and WTO, and a part of the trilateral Benelux economic union. The Netherlands is also a part of the Schengen Area. The Netherlands trade is the main base for the economy. Netherlands’ location means that the nation is closest to the European regions that have the maximum population density. In fact, almost 160 million people stay within a 300 mile radius of the Netherlands, giving the country many regions to trade with. Nearly 70% of Netherlands’ imports come from European nations. The Netherlands trades with a positive trade balance. As the nation enjoys a massive contribution through trade, it is a huge supporter of open trade, along with the US. The Netherlands has a developed economy and has been playing a special role in the European economy for many centuries. With huge natural resources, the Netherlands requires machines to process them and therefore it imports of machinery also dominates in the total imports. The Netherlands imports mostly fuel (29 percent of total imports), machinery, food and live animals, medical products and electronics. The Netherlands’ main import partners are Germany, China, Belgium, The US, The UK, Russia, France. 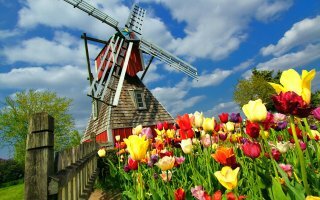 The Netherlands, a country in northwestern Europe, is known for its flat landscape, canals, tulip fields, windmills and cycling routes. The Netherlands, the sixth-largest economy in the European Union, plays an important role as a European transportation hub, with a persistently high trade surplus, stable industrial relations, and moderate unemployment. Industry focuses on food processing, chemicals, petroleum refining, and electrical machinery. A highly mechanized agricultural sector employs only 2% of the labor force but provides large surpluses for food-processing and underpins the country’s status as the world’s second largest agricultural exporter. The Netherlands is part of the Eurozone, and as such, its monetary policy is controlled by the European Central Bank. The Netherlands is part of the trade system of the European Union (EU) and importing and exporting are covered by EC Regulations. A Common External Tariff (CET) is applicable to other countries. Imports of a number of items are restricted and may also depend on the country of origin of the product. Imports of food and agricultural products from outside the EU covered by the Common Agricultural Policy (CAP goods) are often subject to customs duty and quotas and may require a license or certificate. The Netherlands Food and Consumer Product Safety Authority provides information on importing food from outside the EU. Trade with certain countries is forbidden or restricted in accordance with UN, EU or OSCE sanctions. All labelling and information directives of the European Council must be met, as well as local and national regulations. For organic produce, EU legislation requires that imported organic food from third countries be produced to the same standards as that from or EU. There are controls on imports into The Netherlands on a number of products. Based on a risk analysis, containers are selected for inspection. Customs can extract containers from the logistics chain and inspect them. When importing goods into the Netherlands from outside the European Union (EU), you will usually have to pay import duties. You will also have to pay VAT and in some cases excise duty, consumption tax or other levies. Import duties are levied on imported goods. The Dutch Customs authorities levy and collect the duty and transfer the sums collected to the EU. Member states are entitled to retain a portion of the import duties that they collect to cover collection costs. Customs authorities do not levy import duties on products traded between EU member states. However, VAT will be payable. Some products are also subject to excise duty and consumption tax. All EU member states apply the same common customs tariff (CCT). Levying import duties on imported goods is a way of protecting countries against cheaper products from third countries. Companies in some countries can produce their products more cheaply due to lower wages, costs and prices. Adding import duties to these products makes them more expensive, thereby narrowing the price difference and enabling countries to compete more effectively with producers in third countries. In addition to import duties, you normally have to pay VAT. The VAT rate is the same as that which applies to supplies of goods and services in the Netherlands. In some cases VAT can be declared by the customer as if it had supplied the goods/services, under the reverse charging mechanism. mineral oils (such as diesel or petrol). Tobacco products require a valid Dutch excise stamp. Consumption tax is also payable on imports of non-alcoholic beverages. In some cases other levies are payable on imported goods, for instance agricultural levies on agricultural products or anti-dumping duty on industrial products. These levies are intended to prevent products coming onto the European market at exceptionally low prices. Companies and consumers must satisfy a number of regulations before they may import goods. Import taxes may have to be paid, for example, and goods that are not safe may be banned. Customs checks goods that are brought into the Netherlands by companies and private individuals. All goods that are imported from a third country first acquire the status of 'goods in temporary storage'. The importer must declare how they will be treated or used and can then use one of the customs procedures. A well-known procedure is 'release for free circulation'. The goods then acquire the status of 'Community goods' and may circulate freely within the EU single market. The importer pays customs duties to acquire this status. Importers usually rely on the expertise and credit facilities of customs agents to deal with the formalities of importing goods. The ultimate treatment or use is not always known when goods are imported. If the goods are immediately re-exported, they are not released into free circulation in the EU and the importer need not pay customs duties. Customs-approved treatments or uses have therefore been introduced in which the goods are placed under customs supervision and duties are not payable. This procedure is used if, for example, goods must first pass health, safety and environmental checks before they can be released into free circulation. An importer needs a licence to place goods under customs supervision. Other examples of customs-approved treatment or use are external transit, customs warehousing, temporary importation and inward processing. Simplified procedures are often available to help businesses complete customs formalities. If a company keeps approved accounts, for example, Customs is willing to accept them for its checks. This prevents the duplication of work. If necessary, checks of the accounts are combined with a physical inspection of the goods. Businesses that keep their accounts electronically can use a combination of simplified procedures. These include: accounts-based checks of goods in storage in combination with simplified procedures to transport the goods to and from the warehouse. Customs supervises the import (Import Control System), export (Export Control System) and transit (NCTS) of goods. It determines whether the goods comply with health, safety and environmental standards. With regard to health and the environment, it checks, amongst other things, the quality of medicines and tobacco products and inspects the transportation of live animals. With regard to economic requirements, it checks licenses for firearms and ammunition and for counterfeit products. In order to be allowed to export Community goods, the exporter must file an 'export declaration'. There are certain requirements that you must meet for tax purposes. You must also observe a number of rules concerning safety, health, economy and environment.